Shouldn't Israel Be Warning Jordan? Jordan's government spokesman Mohammed Mumuni said that the peace accord with Israel, signed 20 years ago this week, was under threat should Israel continue its violations of the Al-Aqsa mosque on the Temple Mount, Arab-language Sky News reported. Mumuni slammed Israel for saying it was working to preserve the status-quo in the flashpoint site while actually doing the opposite. He further noted that Jordan had formulated a plan to address Israel's actions in East Jerusalem and the Temple Mount. This is far from the first time Jordan has threatened to revoke the peace treaty. Back in February, Jordanian Prime Minister Abdullah Nsur threatened to pull the treaty if the Knesset were to continue advancing a bill to allow Jews to pray on the Mount, the holiest site in Judaism, where the Jordanian Waqf (Islamic trust) has forbidden such prayer. Israeli Ambassador to Jordan Daniel Nevo was summoned Monday by the Jordanian Foreign Ministry following violent clashes between Israeli police forces and Palestinian youths on the Temple Mount in Jerusalem on Sunday. The Jordanian ministry conveyed the Hashemite Kingdom's protest of Israel's so-called violations and break-ins against the Al-Aqsa Mosque complex, and told the ambassador that Israel's actions in the holy site pose a violation of the peace treaty between the countries, and "constitute and extreme insult to bilateral relations," the Jordanian news agency Petra reported. But what does that treaty contain regarding Al-Aqsa? Perhaps it is Israel that should be proclaiming that it is Jordan that is violating the letter and surely the spirit of that treaty? The shooting of Yehuda Glick is a stark reminder that those seeking a return to Judaism’s holiest site are no longer a bunch of fringe extremists. We dismiss them at our peril. Yehuda Glick is a dangerous extremist whose actions could plunge us all into a bloody religious war. Yehuda Glick is a civil rights activist bravely fighting for freedom of worship. Yehuda Glick is a Jewish supremacist seeking to extend Israeli occupation to one of Islam’s most sacred sites...He also represents what could be the greatest ideological challenge in this century to the religious Orthodox establishment, to old-fashioned Zionism and to secular Judaism, all at once. ...Glick kept away some of the more militant Temple Mount activists who seek (and in at least one case actively tried) to destroy the mosques and build the Third Temple in their place...[nevertheless] the campaign to reestablish a more permanent Jewish presence on Mount Moriah is dangerous. Their Judaism is one that exalts sacred stones and hallowed soil above human life, and threatens to take the Zionist endeavour down a dark alley where it was never intended to go. ...a wider movement has also evolved and it isn’t just about religious extremism or ultra-nationalism but something much deeper. ...The Temple Mount movement, like any other wave of religious and national awakening, is full of political charlatans and racist fundamentalists, but those are easily identifiable and while extremely dangerous, have been countered and contained in the past...The real challenge is those motivated by a general malaise and disillusionment with a hidebound religious establishment and ultra-materialistic Israeli state, seeking a return to a fuzzy notion of an ancient and cleaner past. The fact that this past never existed and that by all historic accounts the Jerusalem temples, like any other godly institution, were rife with corruption and political intrigue, doesn’t diminish those yearnings. For over a century most rabbis took a pragmatic line and prohibited entrance to the Mount on the grounds...But many young religious Jews today are challenging the rabbinate on just about every issue. Defying their edicts by going up to pray on the Mount is akin to their insisting that women should be allowed to recite kaddish in public or that Orthodox communities embrace homosexual couples. For them it isn’t about politics, but about challenging old norms...they are looking for a new frontier of Zionism. For some that means founding ecological cooperatives in the Negev desert, for others it is coming to grips with a mystical taboo at the heart of Jerusalem...empty Zionist slogans and flabby liberal cliches of tikkun olam are all failing to energize a disillusioned generation. Many opt out, lose interest in their heritage and seek a comfortable life in Berlin, while others seek to broaden the envelope of their Jewish existence. To them the Temple is the last frontier and Yehuda Glick is its brave pioneer. The Temple Mount Faithful is no longer a fringe element or an obscure cult of religious extremists. Treating them like a bunch of dangerous, yet containable crazy fundamentalists, increases the chances they could cause a major disaster. I wonder why he doesn't suggest annulling the law for the Protection of the Holy Places is he is so concerned but would that be democratic and liberal? And why he doesn't seek to have the Muslims lower their level of violence, verbal and physical, or does he grant them the usual pass on their behavior? The New York Times has reported on the events of the past day and a half here in Jerusalem. If you compare it, for example, to its previous coverage of Women of the Wall, also a religious issue, also controversial, also pitting rights against obsurantist authorities, you will quickly realize that the [paper has taken a side in its reporting. I am going to begin a fisking of it and my comments are in italics within brackets . I doubt whether I can touch on all its poor journalism content, but it's a start. and now to the body of the article which, remarkably, while quoting a Waqf official, the family of the terrorist, a spokesman of the Palestinian Authority and for Jordan, an anti-Jewish rights group Ir Amim, the restaurant owner, the police and Israel's government - and a hospital spokesman for a health report - not one Temple Mount advocate for Jewish rights is present in his/her own words. The action came after Israeli forces shot and killed a Palestinian man who was suspected of involvement in an attempt on Wednesday to assassinate a leading agitator [he actually is a Rabbi, a clergyman. are all other human rights activists termed 'agitators'? And, if any other cleric of any other faith would have been denied freedom of prayer at a site he considers holy, would that term be used? freedom of worship, then, cannot be demanded by Jews?] 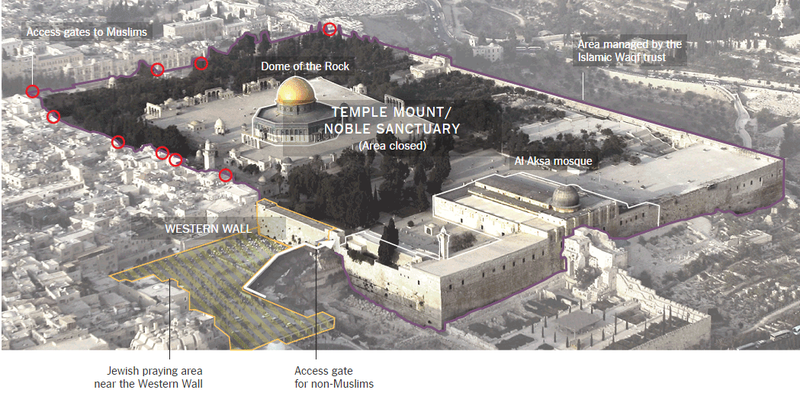 for more Jewish access to the site, which Jews call the Temple Mount and Muslims call the Noble Sanctuary. The closing prevented Muslims from worshiping at Al Aksa mosque, one of the three holiest sites in Islam. Micky Rosenfeld, a spokesman for the police, said that the site had been closed to prevent further unrest, and that a security assessment would be made Thursday evening to decide whether it could be reopened. Israel has increasingly restricted access to the site on certain days, barring young Muslim men or non-Muslim visitors, citing concerns over clashes [and those concerns stem from rabid and irrational incitement, violent behavior by Muslims and attempts to alter the status quo by Muslims as well as the fundamental Temple Denial attitude]. Haaretz, an Israeli newspaper, said that the action on Thursday was the first complete closing of the site since 2000 [by the Waqf as noted above], when a visit by Ariel Sharon — who was then the leader of the opposition in Parliament — helped set off the second Palestinian intifada. In a statement, Nabil Abu Rudeineh, the spokesman for President Mahmoud Abbas of the Palestinian Authority, quoted Mr. Abbas as describing the Muslim and Christian holy sites in Jerusalem as “a red line” [he said more: Jews attempting to enter are a 'herd of cattle' and see below] where there could be no compromise. Israel’s decision was a “grave act” that would “add to the tensions and instability and create a dangerous atmosphere,” he said. The site has been the scene of increasingly fierce clashes between Muslim worshipers and protesters [there are no clashes as all the violence is one-sided, from and by Muslims] and the Israeli police [who simply attempt to restore calm and public order] in recent weeks. Mr. Abbas has accused Israel of trying to change the status quo at the site [but it has not and Netanyahu is on record these past two weeks in particular as saying he will maintain the status quo] to allow open Jewish prayer there, something Israeli and Palestinian analysts alike have warned could set off a major conflagration. Prime Minister Benjamin Netanyahu of Israel has insisted that he will not alter the status quo at the site [ah, one paragraph late], which Israel seized along with the rest of the Old City in 1967 but immediately handed back to the Islamic authorities. Israel maintains responsibility for security. Under an arrangement in place for decades, Jews are not allowed to worship atop the mount, only in the Western Wall plaza below [and the prohibition even to enter the Cave of the Patriarchs, a parallel status quo, was altered in 1967 and is in place until today with far less clashes]. Ultranationalist Jewish activists and groups, often led by Mr. Glick, have made a point of visiting the mount more frequently in recent years and have been campaigning for Jewish prayer rights on the mount, where ancient Jewish temples once stood. More than 8,500 Jews visited the mount last year, compared with fewer than 6,000 in 2010, according to the Israeli police. Mr. Rosenfeld did not respond to requests for information on Jewish visits this year, but Ir Amim, a left-wing group [wow, 'left-wing] that tracks activity at the site, said the police had reported an increase of 20 percent. As darkness fell in the Old City, about 50 Muslims spread small carpets near the Lion’s Gate to say the evening prayer, surrounded by about two dozen Israeli police officers in helmets. A young imam with a long black beard read two verses from the Quran — one that called for fighting [oh, really? ], and one about the acceptance of other religions [and what is that verse?]. “God protect our Aqsa,” the imam said. “Amen,” the worshipers responded. Other issues appearing in other media outlets are covered by Ari Soffer. JERUSALEM — An Israeli-American agitator who has pushed for more Jewish access and rights at a hotly contested religious site in Jerusalem was shot and seriously wounded Wednesday night by an unidentified assailant in an apparent assassination attempt. The shooting of the activist, Yehuda Glick, compounded fears of further violence in the increasingly polarized holy city, where tensions are already high over fears of a new Palestinian uprising against Israeli occupation. Reports that Mr. Glick had been shot came as the United Nations Security Council convened in an emergency session, at the request of Palestinian and Jordanian diplomats, to address the religious strife and growing anger over Israeli housing expansions in East Jerusalem, which the Palestinians regard as the capital of a future state. Israel, which regards all of Jerusalem as its capital, has faced intense criticism over the housing expansions, including from its most important ally, the United States, which has described them as illegitimate obstructions to an any hope for a peaceful solution to the longstanding Palestinian-Israeli conflict. 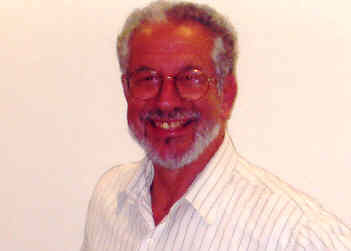 Micky Rosenfeld, a spokesman for the police, said Mr. Glick had been wounded by an assailant who escaped on a motorcycle. He said the police were examining the possibility that the assailant was a Palestinian assassin. Mr. Glick, widely viewed as a provocative figure who has exacerbated tensions between Muslims and Jews, is an American-born leader of groups pushing for more Jewish access to the Temple Mount, the sacred plateau revered by Jews as the site of ancient Jewish temples and by Muslims as the Noble Sanctuary, the location of Al Aksa Mosque, the third holiest site in Islam. The compound is in the Old City of Jerusalem in territory that Israel seized from Jordan in the 1967 war and then annexed in a move that was never internationally recognized. Tensions over the site, which is administered by the Muslim authorities, have sharply risen in recent months, with Muslim worshipers and protesters clashing with the police and accusing them of restricting access. On Sunday, Prime Minister Benjamin Netanyahu of Israel ordered an increase in the Jerusalem police force to quell the violence. Palestinian leaders have decried the increasing Jewish presence on the mount, as Jewish activists have made a point of visiting more frequently. “The solution is to remove the causes for this tension, primarily the presence of the settlements in Jerusalem which serve as provocation to the local residents, and second, to stop the prevention of prayers,” Mr. Abbas said Wednesday in an interview broadcast on Israel’s Channel 10. The shooting of Mr. Glick took place outside the Menachem Begin Heritage Center in a predominantly Jewish area of central Jerusalem. Mr. Glick and his supporters had been attending a Temple Mount convention there. Peeking at his cellphone while on the podium Mr. Glick joked that he kept it on just in case permission came through to rebuild the Jewish temple at the ancient site, in which case, he said, he would have to leave. Mr. Glick has described himself in interviews as a licensed tour guide who makes a living by taking groups on tours of Temple Mount. The police have banned him several times from the site, a measure that Mr. Glick has challenged in the Israeli courts. At the Jerusalem hospital where Mr. Glick underwent surgery, his father, Shimon Glick, told reporters his son had received numerous death threats but that the police had given him no protection. There was no hint of conciliatory talk by either the Palestinian or Israeli speakers, however, with both appearing to harden their long-held differences. JERUSALEM — This city’s most contested sacred site reopened for Muslim worship Friday morning after an extremely rare daylong closing...Palestinian leaders called for a “day of rage” because of the closing on Thursday and the killing by Israeli forces of a Palestinian man suspected in the assassination attempt on Wednesday night against Yehuda Glick. Mr. Glick is a right-wing activist who promoted increased Jewish access and prayer at the site, known to Jews as the Temple Mount and to Muslims as the Noble Sanctuary. “May Allah deny his mercy to those who prevent us from entering Al Aksa,” the imam said. The deterioration of the situation in Jerusalem, at a time when so many are eager for signs of progress towards peace, is deeply troubling. It’s hard to imagine sites more sensitive than those in Jerusalem and, today, we are very concerned by recent tensions surrounding the Temple Mount / Haram al-Sharif. It is absolutely critical that all sides exercise restraint, refrain from provocative actions and rhetoric, and preserve the historical status quo on the Temple Mount / Haram al-Sharif – in word and in practice. That’s why Israeli Prime Minister Netanyahu’s recent statements expressing his commitment to maintain the status quo there and not to make any changes at the site are so important. We welcome the Prime Minister’s comments. The continued commitment by Israelis, Palestinians, and Jordanians to preserve the historic status quo at the holy site is critical. Any decisions or actions to change it would be both provocative and dangerous. We urge the leaders of all three parties to exercise decisive leadership and work cooperatively together to lower tensions and discourage violence, alleviate restrictions on Muslim worshipers, and reinvigorate long-standing coordination mechanisms and relationships that have served over the decades to preserve the historic status quo as it pertains to religious observance and access to the site. These arrangements are essential for maintaining calm at this important and holy site. What I placed in bold is pure unadulterated undemocratic, anti-human rights and a perversion of the freedoms of religion that America criticizes in other countries around the world. The status quo is not "historic" and in practice denies Jews our historic rights. The United States urged that the compound be reopened to Muslim worshippers, and called on all sides to exercise restraint amid spiralling tensions in Jerusalem. State Department spokeswoman Jen Psaki also condemned the shooting of hardline rabbi Yehuda Glick, an Israeli-US dual national. I strongly condemn yesterday’s shooting of a U.S. citizen outside the Menachem Begin Heritage Center in Jerusalem. My thoughts and prayers are with the family. The State Department is in touch with authorities as we seek more information. I am extremely concerned by escalating tensions across Jerusalem and particularly surrounding the Haram al-Sharif/Temple Mount. It is absolutely critical that all sides exercise restraint, refrain from provocative actions and rhetoric, and preserve the historic status quo on the Haram al-Sharif/Temple Mount – in word and in practice. The continued commitment by Israelis, Palestinians, and Jordanians to preserve the historic status quo at this holy site is critical; any decisions or actions to change it would be both provocative and dangerous. The Haram al-Sharif/Temple Mount must be re-opened to Muslim worshipers and I support the long-standing practices regarding non-Muslim visitors to the site, consistent with respect for the status quo arrangements governing religious observance there. I am in close touch with senior Israeli, Jordanian, and Palestinian leaders to try to deescalate the situation. I urge the leaders of all three parties to exercise decisive leadership and work cooperatively together to lower tensions and discourage violence, alleviate restrictions on Muslim worshipers, and reinvigorate long-standing coordination mechanisms and relationships that have served over the decades to preserve the historic status quo as it pertains to religious observance and access to the site. MS. PSAKI: ...let me say we condemn yesterday’s shooting of a U.S. citizen in Jerusalem. Our thoughts and prayers are with the family. We’re in touch with authorities as we seek more information. We’re extremely concerned by escalating tensions across Jerusalem and particularly surrounding the Haram al-Sharif/Temple Mount. It is absolutely critical that all sides exercise restraint, refrain from provocative actions and rhetoric, and preserve the status quo in – on the Haram al-Sharif/Temple Mount in word and in practice. It must be reopened to Muslim worshippers. The continued commitment by Israelis, Palestinians, and Jordanians to preserve the historic status quo at this holy site is critical. Any decisions or actions to change it would be both provocative and dangerous. And finally, we’ve been in close touch, as I’ve mentioned or alluded to, with senior Israeli, Jordanian, and Palestinian officials to try to de-escalate the situation. I expect the Secretary will be speaking with Prime Minister Netanyahu over the next 24 hours as well. ...QUESTION: All right. And then you said – any change to which situation would be provocative and dangerous? I’m sorry. MS. PSAKI: Well, as you know, we support the longstanding practices regarding non-Muslim visitors to the site, to Haram al-Sharif/Temple Mount. And consistent with our respect for the status quo, we would like to see it returned to that. QUESTION: You would like to see a return to what it was yesterday, before the shooting happened? MS. PSAKI: Well, it’s consistently been the case that we believe that Muslim worshippers should be able to worship, that there’s been a consistent position of the United States. QUESTION: No, I understand that. MS. PSAKI: -- and the death of an American citizen. MS. PSAKI: Our position hasn’t changed on this issue. That’s true. QUESTION: Secretary Kerry – is this still on Israel? QUESTION: In your opening when you talked about – you said it must be reopened to Muslim worshippers, you’ve seen the Palestinian spokesman or – spokesman for the Palestinian president say that the closure of it was a declaration of war. What do you make of that? MS. PSAKI: We wouldn’t characterize it in that way or echo that. QUESTION: Well, is that the kind of language that you’re looking for? QUESTION: Well, okay, fair enough. The Israelis have been accusing President Abbas of inciting this kind of behavior. Do you believe that that is the case? MS. PSAKI: Well, we certainly have been encouraging the leaders of all parties to exercise not only decisive leadership, but to work cooperatively together and lower tensions, and obviously, lowering tensions means lowering rhetoric and also taking actions that reflect that. ...QUESTION: Jen, you said you’re extremely concerned with the situation in Jerusalem. In terms of the security operation that you’ve seen so far, are you concerned with that or are you so far satisfied; you just don’t want an escalation? MS. PSAKI: Do you mean by the Israeli authorities? MS. PSAKI: I wasn’t speaking to that. I was speaking to the tensions that obviously we’re all aware are happening on the ground right now. MS. PSAKI: I don't know if there’s – if you want to be more specific, what – might be more helpful. QUESTION: Well, can I ask about Sweden? QUESTION: Wait – oh, okay. QUESTION: Yeah. Israel recalled the ambassador in Sweden in protest of the recognition of a Palestinian state. Now, I mean, are you concerned that this is not a one-off? There’s a lot of talk in Europe about other countries accepting a de facto Palestinian state. And so I’m just wondering when you talk about – kind of concerned about the future, it doesn’t seem like Israel will just continue to be able to call ambassadors around the world. I mean, do you think this is the right way to be dealing with this instead of addressing the issue? MS. PSAKI: Well, we certainly believe that the status quo is not sustainable and have long believed that. And obviously, no one wants to see a situation where there’s a cycle after cycle of violence and tensions and that the Israeli people are concerned about their safety and security, the Palestinian people have concerns. That’s why we support a peace process and a resolution. As it relates to Sweden – and let me just reiterate this just so we can get it out there – as you know, we support Palestinian statehood, but it is – it can only come through direct negotiations between the parties that resolve final status issues and end the conflict. Certainly, it doesn’t require our view. It requires the facts out there of what we’ve seen from some countries responding to the lack of a resolution of a peace process out there, and I think that speaks for itself. ...QUESTION: I just want to know if there’s any update on the investigations into the two cases of American citizens being killed. MS. PSAKI: No, there are no updates that I have. MS. PSAKI: It’s been a couple of days, yes. QUESTION: It’s been about a week. MS. PSAKI: We continue to press for a speedy resolution of the investigations. QUESTION: But would you call this speedy, though? MS. PSAKI: Elise, it’s been a week. We discuss this in every – almost every conversation we have, but there hasn’t been a resolution yet. QUESTION: Right, but – right, but there was a resolution to the – a very speedy resolution, apparently, to the – what happened last night. Sie sind nicht nur religiös, sondern auch nationalistisch. „Der Tempel ist Teil des Judentums. Deshalb zerbrechen wir bei Hochzeiten Glas. Wir erinnern damit an die Zerstörung des Tempels. Es ist also ein legitimes Ziel, dass der Tempelberg wieder jüdisch wird“, erklärt Yisrael Medad von der Organisation El Har HaShem, die sich seit den 70er Jahren genau dafür einsetzt. They are not only religious, but also nationalistic. "The temple is part of Judaism. Therefore, we break a glass at weddings and thereby we so remember the destruction of the Temple. So it is a legitimate aim, that the Temple Mount is to be Jewish again," says Yisrael Medad of the El Har HaShem organization that works for that exact aim since the 1970s. In Jerusalem stehen einige der größten Heiligtümer der Juden und Muslime. Derzeit entzündet sich dort wieder der alte Streit, wem das Areal des Tempelbergs in der Altstadt gehört. Vor 14 Jahren hat der Besuch Ariel Scharons die zweite Intifada ausgelöst. In den Augen der Muslime ist der Jude Akiva, ein 25 Jahre alter Mann mit Kippa, ein Dieb, der ihnen den Tempelberg wegnehmen möchte. Sie sehen seinen Besuch als Provokation. Die Polizei begleitet ihn zur Sicherheit. Denn mit den zunehmenden Besuchen von Juden auf dem Tempelberg in den vergangenen Monaten steigt auch die Zahl der Krawalle. Der Nahostkonflikt tritt hier inmitten der Altstadt Jerusalems in seiner reinsten Form zutage: Muslime und Juden streiten sich darüber, wer das Recht auf das Stückchen Land hat, das für beide ein heiliger Ort ist. Hier steht der Felsendom und die Al-Aqsa-Moschee, der drittheiligste Ort für Muslime. Hier soll Prophet Mohammed seine Himmelsreise angetreten haben. Für religiöse Juden ist es der Ort, an dem der erste und der zweite jüdische Tempel standen, letzterer wurde im Jahr 70 nach Christus von den Römern zerstört. Einige religiöse Juden wollen deshalb auch an bestimmten Orten auf dem Tempelberg beten – was Nicht-Muslimen generell verboten ist. „An jedem anderen Ort könnte man fragen: Warum sollen nicht auch Nicht-Muslime dort beten dürfen? Aber man muss es im Kontext des gesamten Konfliktes sehen. Es geht hier um Politik, nicht um das Recht auf Gebet“, erklärt Aviv Tatarsky von Ir Amim, einer Nichtregierungsorganisation, die sich für die Koexistenz in Jerusalem einsetzt. Der Status quo lautet: Die jordanische Waqf, eine Art muslimische Stiftung, verwaltet den Tempelberg, die israelische Polizei kümmert sich um die Sicherheit. Anfang des Jahres wurde in der Knesset über den Status quo auf dem Tempelberg diskutiert. Muslime werten es als Zeichen dafür, dass ihnen der Tempelberg weggenommen werden könnte. Nicht umsonst sprach Palästinenserpräsident Mahmud Abbas deshalb vergangene Woche davon, dass den „Siedlern“ der Zutritt verweigert werden sollte und dass diese kein Recht hätten zu kommen und den Ort zu entweihen. Abbas meinte nicht die Ultraorthodoxen mit ihren langen, schwarzen Mänteln und den großen Hüten, sondern die Nationalreligiösen mit gehäkelten Kippot und T-Shirts. Sie sind nicht nur religiös, sondern auch nationalistisch. „Der Tempel ist Teil des Judentums. Deshalb zerbrechen wir bei Hochzeiten Glas. Wir erinnern damit an die Zerstörung des Tempels. Es ist also ein legitimes Ziel, dass der Tempelberg wieder jüdisch wird“, erklärt Yisrael Medad von der Organisation El Har HaShem, die sich seit den 70er Jahren genau dafür einsetzt. Die Nationalreligiösen wollen Präsenz zeigen, fast täglich kommen sie mittlerweile auf den Tempelberg. Sie sind in Israel längst keine Randgruppe mehr, sondern gewinnen auch in der Knesset immer mehr Unterstützung. So sorgen Politiker aus dem rechten Lager für mediale Aufmerksamkeit, wenn sie über den Tempelberg spazieren. Doch Aktionen wie diese sind äußerst heikel: Ariel Scharons Besuch auf dem Tempelberg im Jahr 2000 war ein Funke, der die zweite Intifada mitentfachte. Aus Sicherheitsgründen ist es jungen Muslimen deshalb an bestimmten Tagen untersagt, den Tempelberg zu besuchen. Und so ist der Besuch von Akiva auch ein nationalistischer Akt, der die Muslime verärgert. „Raus hier“, ruft ihm ein älterer Mann beim Vorbeigehen entgegen. „Ruhe“, kontert einer der Polizisten, der Akiva begleitet. Akiva aus der Siedlung Kiryat Arba im Westjordanland besucht den heiligen Ort zum ersten Mal. In einer Reihe mit Touristen hat er vor der Mughrabi Brücke neben der Klagemauer gewartet – dem einzigen Zugang für Nicht-Muslime, der nur zu bestimmten Zeiten geöffnet ist. „Es ist mein Geburtstag nach jüdischem Kalender, deshalb wollte ich endlich herkommen“, sagt er. In Jerusalem, some of the largest sanctuaries of Jews and Muslims. Currently there again ignited the old debate of who owns the site of the Temple Mount in the Old City. 14 years before the visit of Ariel Sharon triggered the second intifada. As if they had only waited one like him, the women begin to call. "Allahu akbar", it resonates across the square in front of the Dome of the Rock, with its golden dome, as Akiva on this sunny autumn afternoon Haram al-Sharif, the Temple Mount in Jerusalem, enters. The calls interrupt the idyllic tranquility, drown out the birdsong. With each step, the Akiva is accompanied by two police officers, vote more and more Muslims on the Temple Mount with a. "Allahu akbar" - God is greater. A Muslim curses in Hebrew: "Only a thief has to be here to protect her." In the eyes of the Muslims is the Jew Akiva, a 25 year old man wearing a kippah, a thief who wants to take away the Temple Mount. You see his visit as a provocation. The police accompanied him to safety. Because of the increasing visits by Jews on the Temple Mount in recent months also increases the number of riots. The Middle East conflict occurs here in the old city of Jerusalem in its purest form revealed: Muslims and Jews are arguing over who has the right to a piece of land, which is both a sacred place. Here stands the Dome of the Rock and the Al-Aqsa Mosque, the third holiest place for the Muslims. Here Prophet Mohammed is said to have begun his journey to heaven. For religious Jews, it is the place where the first and second Jewish Temple stood, the latter was destroyed in 70 AD by the Romans. Some religious Jews therefore want to pray at certain locations on the Temple Mount - what non-Muslims is prohibited. "On any other place you might ask: Why are not supposed to pray non-Muslims there? But you have to see in the context of the entire conflict. This is about politics, not about the right to prayer, "says Aviv Tatarsky Ir Amim of, a non-governmental organization that works for the coexistence in Jerusalem. The status quo is: The Jordanian Waqf, a kind of Muslim Foundation, administers the Temple Mount, the Israeli police take care of security. Beginning of the year was discussed in the Knesset on the status quo on the Temple Mount. Muslims consider it a sign that they might be taken away from the Temple Mount. Not for nothing said Palestinian President Mahmoud Abbas last week therefore assume that the "settlers" of the access should be denied and that they had no right to come and the profane place. Abbas did not mean the ultra-Orthodox, with their long black coats and big hats, but the National Religious with crocheted kippot and T-shirts. They are not only religious, but also nationalistic. "The temple is part of Judaism. Therefore, we break the glass at weddings. We remember so that the destruction of the Temple. So it is a legitimate aim, that the Temple Mount is Jewish "again, Yisrael Medad says of the Har HaShem El organization that works to accurately since the 70s for it. The National Religious want to show presence, almost every day they come now to the Temple Mount. You are in Israel no longer a fringe group, but also win in the Knesset more support. To ensure politicians from the right wing for media attention when they walk on the Temple Mount. But actions like these are extremely delicate: Ariel Sharon's visit to the Temple Mount in 2000 was a spark that ignited the second Intifada. For security reasons it is young Muslims therefore prohibited on certain days, to visit the Temple Mount. Especially on high holidays Muslim men must remain under 50 years outdoors. The 25-year-old Jamal is affected. "Last week, they have over there barriers built up," he says. It was the Jewish festival of Succoth, where many Jewish believers visit the Temple Mount. "You have not let in us. But we can not prevent us to try anyway. We then prayed before the barriers. "Not infrequently stones fly. The policemen who guard the entrances to the Temple Mount are prepared for riots. They carry batons with them, shields are available. Young Muslims are frustrated: "It's getting worse. They provoke us and want us to take away the Temple Mount. But this is our sanctuary. " And so the visit of Akiva is also a nationalist act that angered the Muslims. "Get out of here," calls him against an elderly man in passing. "Silence," counters one of the policemen, who accompanied Akiva. Akiva from the Kiryat Arba settlement in the West Bank visited the holy place for the first time. In a number of tourists he has been waiting in front of the Mughrabi Bridge next to the Wailing Wall - the only access for non-Muslims, which is only open at certain times. "It's my birthday according to the Jewish calendar, so I finally wanted to come," he says. Less than 30 words out of an hour's interview but I trust much of what I said assisted the background understanding. In response to my article on the Sultanate of Oman [NYR, August 14], several scholars have pointed out that the descendants of slaves in Omani society have a distinct history that should be carefully distinguished from Omanis who have returned to the Arabian Peninsula from East Africa in recent decades. Oman is believed to have ties to Africa going back to the early years of the Islamic era, and following the conquest of Portuguese trading posts in the late seventeenth century, large numbers of Omanis settled on the East African coast—especially after 1832, when the Omani sultan moved his court to Zanzibar. During this era, African slaves were dispersed among tribes across Oman, and their descendants constituted a separate social class. However, while many slaves would have been by origin Swahili speakers, they would have assimilated into Arabic-language culture within a generation or two. By contrast, the so-called “Zanzibari” Omanis, of which there may now be 100,000, are the descendants of Arabs who emigrated to East Africa and whose families returned beginning in the 1960s and 1970s. These Zanzibaris are Swahili-speaking and have remained a distinct group in contemporary Oman; a number of them have served in high positions of the civil service and their Zanzibari heritage is a marker of elite status. Some scholars, including Marc Valeri, have further noted linguistic and class distinctions between Swahili-speaking Omanis who had lived in Zanzibar, Kenya, and what is now Tanzania, who are also English-speaking; and those who had lived in Central Africa, who are also French-speaking. As J.E. Peterson observes, one of the paradoxes of this history of return is that while the descendants of African slaves are considered fully a part of Omani Arab society, the Omani-Zanzibari elite, who are at least in part ethnically Arab, tend to be regarded as “foreign” to a certain extent. For the record, the great-grandfather of the current Omani sultan, who as I mentioned in my article is reported to have spoken Gujarati and Swahili better than Arabic, was Sultan Faisal bin Turki (ruled 1888–1913), not Taimur bin Faisal. is a Palestinian human rights activist, having been a member of the British-based ENOUGH! coalition that seeks to end the "Israeli occupation of the Gaza Strip and West Bank." She is also a signatory of Jews for Justice for Palestinians. She has now taken her pro-Palestinianism to a new low, one that has been around in the background under the category "It's All Israel's Fault" a la Lord Montagu and his fear of being returned to the ghetto. The actress said: “I don’t think people like Jews. They never have. English literature, my great love, is full of greasy and treacherous Jews. There is not enough room to counter her Israel criticism but why is she stupid? one always needs a Jewish accountant? The Jewish accountant image just feeds the anti-Semitic prejudice, no? Greedy avarice, etc.? Not to mention strenthening the assumption that Jewish accountants know how to finegle and cut corners and perhaps even steal. And the text, in German. QUESTION: You called – late on Friday you issued a fairly strong statement in your name calling for a speedy and transparent investigation into the killing of a U.S. citizen apparently by – or your statement said by the Israeli Defense Forces. It’s been 48 hours since – more than that, actually – 60 hours, say, since you issued that statement. Have you yet seen a speedy and transparent or speedy or transparent investigation by the Israelis? MS. PSAKI: Well, Arshad, I don’t have a day-to-day evaluation of the investigation. We remain closely engaged with authorities. Our consulate-general in Jerusalem is in contact with the family, but obviously, we want to see that investigation rapidly concluded. MS. PSAKI: I will let you know if there’s more that we can convey. MS. PSAKI: I’m well aware. That’s why we put out the statement on Friday. MS. PSAKI: Local authorities have the lead, Elise. Not that I’m aware of. QUESTION: Well – but, I mean, usually in the killing of an American citizen – I mean, usually the FBI or some other kind of U.S. law enforcement agency would be involved in the investigation. You’re just leaving it up to the Israelis to investigate these – supposed Israeli killing of an American citizen? MS. PSAKI: I will check to see if there are any U.S. officials involved. MS. PSAKI: Yes. A three-month-old baby. QUESTION: Yes. How is the investigation into that going? MS. PSAKI: I don’t have any updates on the investigations. I would encourage you all to ask the Israeli authorities that question. ...QUESTION: Hold on, Elise [Labott, CNN]. Several months ago, there was a shooting – there was an incident involving a shooting of some Palestinian youths. They weren’t Americans, but you called at that time for an – this was the video, the one that was captured on videotape. Are you aware of the results of that Israeli investigation? ...QUESTION: In the case of the Palestinian American teenager who was killed on Friday, are you – do you know the circumstances under which he was shot? MS. PSAKI: I don’t have any more details. QUESTION: There are – okay. The reason I ask is because there are reports out there that he was throwing Molotov cocktails at cars on a highway. And I’m wondering, if that is the case, would you have still been so speedy in putting out a statement and offering your condolences to the family? The argument that is being made by some in Israel is that this kid was essentially a terrorist. And you don’t agree with that, I assume, but I don’t know, so that’s why I’m asking. MS. PSAKI: Correct, we don’t. I don’t have any more details on the circumstances now. QUESTION: So you – does that – that would apply even if he was throwing Molotov cocktails? MS. PSAKI: I’m not going to speculate. I don’t have details to share. ...QUESTION: Well, I’ve got – I’ve got to get one more on this and then I’m done. There is a photograph of this teenager’s – this teenager being buried today, and he’s wearing a Hamas headband. It was put on him, obviously. Is that of concern at all to you guys? MS. PSAKI: I just don’t have any more on this particular case. QUESTION: Back to the baby. Can you – I mean, supposedly it was by Palestinian militants or whomever, not by the Israelis. Could you say or check whether – that the U.S. is involved in the investigation into the killing, into that car accident? MS. PSAKI: I will see if there is U.S. involvement in either of the cases. Okay, and what do you think of Ms. Psaki? QUESTION: To go back to Matt’s question about – were you aware when you put out the statement on Friday night that there were allegations that the Palestinian American teenager had been throwing – our story said a Molotov cocktail and it was – it had run before your statement came out. So didn’t you – did you know at the time when you put out the statement that there were allegations that he was engaged in violence? MS. PSAKI: Well, there were media reports, Arshad. MS. PSAKI: Beyond that, I don’t have anything to read out for you. QUESTION: Right, no. But I just wanted to get on the record that you knew about those reports when you put out the call for the speedy investigation. QUESTION: -- you do not believe that this teenager was throwing Molotov cocktails. Is that right? MS. PSAKI: That’s – I don’t have any more to outline or confirm for you in terms of the circumstances. QUESTION: No, he said that you don’t believe that to be the case. MS. PSAKI: That’s not what I said. QUESTION: Do you? And you said no, you – no. MS. PSAKI: He asked me if we thought he was a terrorist, and I said no. MS. PSAKI: I think we’re going to have to move on now. P.S. and the video at 31:50. Is This The Correct Way to Hold a Firebomb? How Bad is Ha-Ha-Haaretz, You Ask? Clever Use of the Term "Retreat"
Who Was Anti-Partition in 1937? Do You Always Need a Bank to Settle?